AN evening with a hot blooded Italian woman who loves her Frescobaldi wines was like walking through the streets of Italy during a parade. 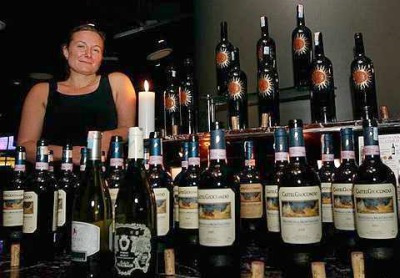 Erika Ribaldi, the Asia Pacific area manager for Frescobaldi Wines, is a vivacious woman, just like the wines she sells. She was well received at a special wine dinner hosted by Sunrise Wines and Spirits a Prego in Westin Hotel Kuala Lumpur recently. Instead of quoting vintages, grape varieties and tasting notes, she brings life to the wines, quoting funny anecdotes that will ensure you remember your drink. Ribaldi is a firm believer that the best way to pair a wine is to pair it with people especially here in Asia where each dish is served together. Firm believer: Ribaldi is a vivacious woman, just like the wine she sells. “I also believe that it is important for people to be able to remember the names of the wines served because nobody would want to order something they cannot pronounce,” she added. As dinner began, Ribaldi who is just as excited about food began to enlighten the diners at the table about each wine. First on the menu was the Pinot Grigio Attems 2009 paired with Torcione di Coniclio (pressed rabbit, fig as carpaccio and air). “This wine is like a ride on a Vespa (scooter) in the city of Rome. It is very light and is an easy ride, a fun vibrant wine,” she said. The fresh rabbit is a typical countryside food that pairs ideally with the wine. Chef David King, the director of Kitchens at Westin said the meal was essentially Italian inspired but believed that the food should not compete with the wine. Good pair: Luce 2006 wineserved for the third courseaccompanied with the Pizzocchericon Petto di Anatra. 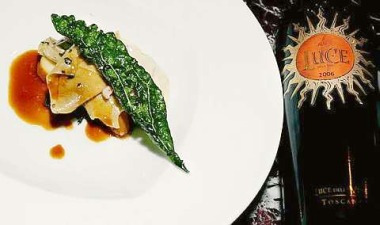 “The wine has to take centre stage so I have approached the traditional dishes with a twist,” he added. Pomino Bianco 2009, a wine which offers an ultra-velvety texture, rich depth and superb balance made it to the table next. Produced in Tuscany’s elevated landscape, the hilly cool climate helps to make the wine fresh. To complement this serious wine as Ribaldi calls it, the Insalata Russa, a delicious new Italian Russian Salad with Pea, Potato, Carrot, Tuna and Egg was served. King took the ingredients in this Russian salad including lettuce, tuna, potatoes, carrot, peas and mayonnaise and re-invented the dish for a touch of sophistication. ‘A sweet neverending kiss with red lipstick’ — that is Luce 2006 in Ribaldi’s opinion. The wine served for the third course accompanied with the Pizzoccheri con Petto di Anatra, a re-vamp of the Italian alp classic casserole of buckwheat pasta, potato, cabbage, kale, sage and fontina. “For me it is earthy and reminds me of a morning after I clean my coffee machine. It is ethereal,” she said. The pairing of three vintages of Castelgiocondo Brunello di Montalcino with Manza Tre Modi Diversi were the highlight of the evening that held many personal memories for Ribaldi herself. “If God had cases of liquor, one would be champagne to celebrate and another would be the Brunello to forget mankind’s misdeeds,” she said irreverently. According to King, the beef was the perfect choice to bring out the flavours of the wines. They choose a lesser cut since the Blackmore wagyu meat is the best in this region. Finally, to balance the carnivorous meal, the Illyquore Pannacotta, a creamy Italian dessert is just right to the core. The range of Frescobaldi wines can be purchased at major wine stores as well as hotels.